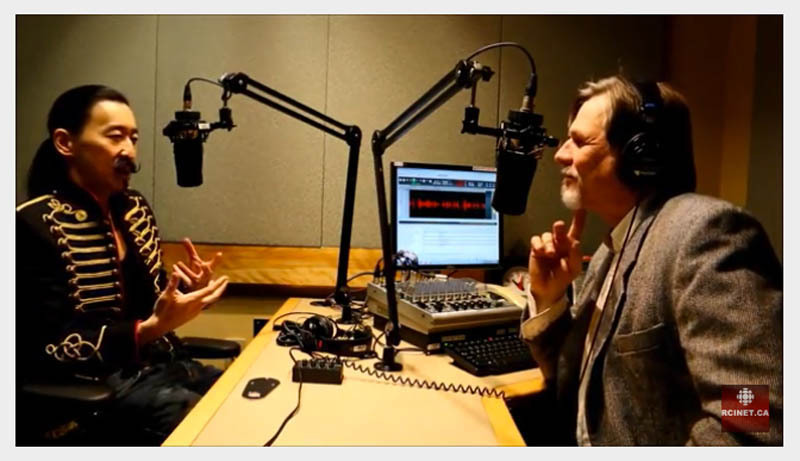 Playwright and performer Tetsuro Shigematsu, left, talks to Marc Montgonery of Radio Canada International. You can watch the video below this review. Montrealers, do yourself a big favour and catch Tetsuro Shigematsu’s Empire of The Son at the Centaur Theatre. Saturday, Jan 14, 2017 is the last day you can see this tour-de-force. It’s storytelling at its best. The Vancouver Sun and the Georgia Straight said it was that city’s best show in 2015. I’m going to watch it again, myself. This one-man show reminds me, in a very good way, of the work of the late monologue artist Spalding Gray, though Shigematsu is more animated, and doesn’t sit at a desk. He also feels regret for all the things that he did not say when he had the chance. His father had been sick for several years, but on the night when Shigematsu said “Why don’t you get some sleep, Dad,” he had no way of knowing that father would not regain consciousness again before he died. 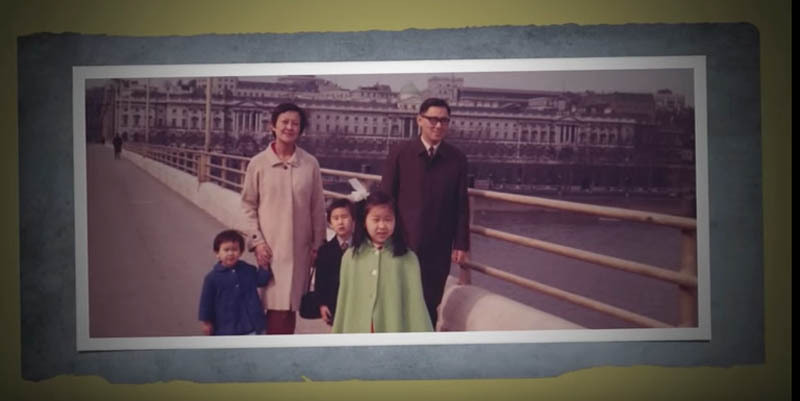 The Shigematsu family in London, before the birth of Tetsuro and his twin sister, Hana. Ironies abound. 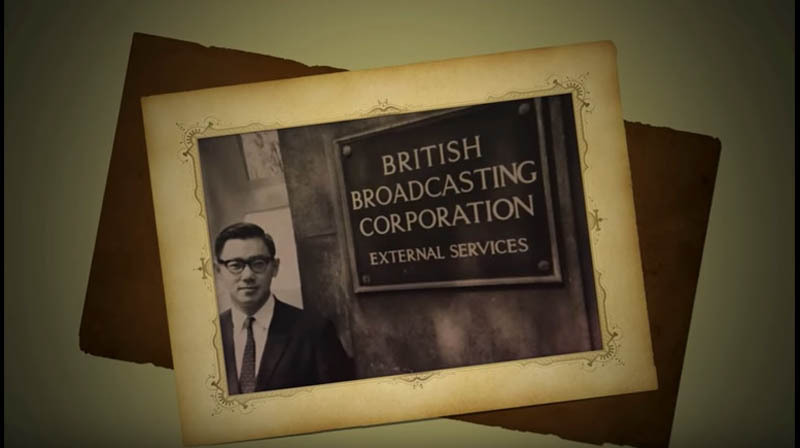 Shigematsu’s father, Akira, was an announcer for the BBC in London, then for the CBC in Montreal. He explained current events to his listeners all over the world, but was extremely taciturn at home. Shigematsu’s father survived the horrors of the bombing of Hiroshima, had tea with Queen Elizabeth, and saw Marilyn Monroe sing Happy Birthday to John F Kennedy, but when Tetsuro asked him about any of those events he got short answers that indicated his father didn’t think any of it was that big a deal. Akira Shigematsu worked for the BBC in London before he moved to Montreal with his family. Like much great art, Empire of The Son is both universal and particular. You might well cringe when Shigematsu relates some of the snarky, flippant things he said to his father in his teenage years. Did you say similar things yourself? Did someone say such things to you? Chances are, viewers will be able to relate to many incidents, they will recognize themslves and their own family dynamics. Years ago, I saw Rising Son, in which a younger Shigematsu talked about his father, his family, himself, experiences at school, stupid stereotypes about Asians, and a trip he took to Japan. It was a good show with lots of laughs, but Empire of The Son is on a whole other level of artistry. Is it corny and clichéd if it compare one to grape juice and one to wine? Yeah, probably. But it will have to do for now. While death, dying and crying might sound sad and depressing Empire of The Son contains many light moments. While the show is mostly about Shigematsu and his father, he has some heartwarming, truly poetic things to say about his three sisters. You should hear them for yourself, I won’t spoil them. Empire of The Son has some clever props that help to tell the story, something that Rising Son did not have. There’s a fascinating combination of high tech and low tech happening there. Shigematsu manipulates a digital camera to project images of a little bathtub, a tiny boat made from a paper and a toothpick, a miniature skateboard, or the destruction of Hiroshima itself, onto a screen behind him. You might want to see Empire of The Son with parents, siblings or friends, depending on who might be available to you. If all your friends and family members are busy, do not hesitate, go by yourself. Don’t miss Empire of The Son. You will thank me later! Budding writers and actors would appreciate it, too, I think. Empire of The Son of the Son will be at the Centaur Theatre Thursday, Jan. 12, Friday, Jan. 13, and Saturday Jan. 14, at 7:30. The Centaur Theatre is in Old Montreal at 453 St. François-Xavier. Place d’Armes is the nearest metro station. At another time of year, I could say “run, don’t walk,” but that might be unwise, with the weather and the state of the sidewalks being unpredictable. You can buy tickets online, though there is a $2 service charge. Empire of the Sun is a touring production of the Vancouver Asian Theatre. It will be at the Factory Theatre, in Toronto from Wednesday, Jan. 18, until Sunday, Jan 29, 2017.